Sometimes Jagoffery happens in the home. And when it does, well, we have to point it out. This wouldn’t be a “highly responsible” blog if we didn’t do that, right? Just in case ya don’t know, them-there are used dryer sheets. Usually, the protocol is to use one of these per dryer load to freshen your laundry just after washing it. OR, in some bachelor cases, you use these to make dirty clothes smell better before you “recycle” them to go out on the weekend without the laborious task of actually washing them. Some people even see these as even a more versatile tool in that, hidden under the car seat, can act as a car freshener. So, in case I have to draw the play up for you, laundry comes out of the dryer, these things fall on the floor and.. boom… that’s where they stay (for some people in my house). Just laying on the basement floor around the laundry area. You can’t see it in the photo but, they are laying a mere 3-feet from a garbage can that COULD be containing them but… nope! Hey… I know that we have a standard Pittsburgh basement floor… partially painted with leftover paint from another project but….dryer sheets are not the answer. 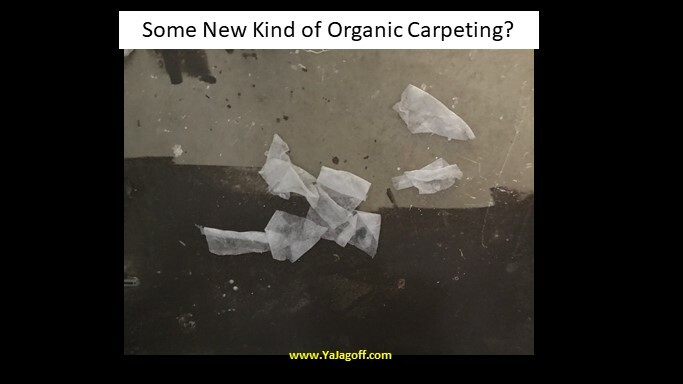 While they have many uses, leaving dryer sheets on the floor to eventually create an organic-dryer-sheet-plush-floor-covering isn’t one of them. Not sure why nobody else in my house has the ability to bend over and pick them up but, apparently we need a family-plan subscription to a yoga app! Pick up the old dryer sheets and put them in the garbage, Ya Jagoffs!